With a name that attaches a South American furry feline to a mechanical artificial agent, Ocelot Robot should cause more than a little speculation. Who or what is Ocelot Robot? Formed in West LA by four day job guys who use quirky stage names (Johnny Awesome, the Grid, Bonasty, Daltron, and ap#1), Ocelot Robot plays something probably best described as melodic rock with a power pop and post punk foundation. Call it Green Day, without all the commerical arrogance, blending with Goo Goo Dolls at their most accessible pop best. With tongues firmly in cheek, on their debut Ready to Go, Ocelot Robot rumbles along with catchy melodies and endless hooks, all surely in the name of rock n roll fun. You can hear this enthusiasm across the entire disc with Dead Celebrity, Again & Again, and Don't Play Nice just a few of the more energetic numbers. However, Ocelot Robot is probably at their best when the high energy rock merges the reckless pop friendliness as on Reckless, Beautiful Girl, or the quite catchy Brand New Girl (a near Goo Goo Dolls rip). Some songs fell flat on my ears like Isabelle and Give It to Me. (But this could be because the overall production/mix sometimes also sounds flat.) With most songs coming in at an efficient three minutes, Ocelot Robot closes Ready to Go with the oppressively boorish 11 minute No One Left. Why it's there is anyone's guess. 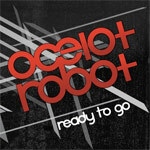 For a first effort Ocelot Robot's Ready to Go is a solid start: a hook-laden platter of interesting power pop rock.